Many simulations within the field of renewable energy involve the coupling of different physics. An exemplary example is the analysis of a wind turbine. Here the structure (blades, tower, generator, gearbox, etc.) is interacting with the fluid. Within the Unsteady Aerodynamic Experiment Phase VI of NREL, a small (real size) wind turbine was measured in the NASA Ames wind tunnel. This example is therefore suited for simulation validation as the experimental parameters in a wind tunnel are more constant than for field measurements. 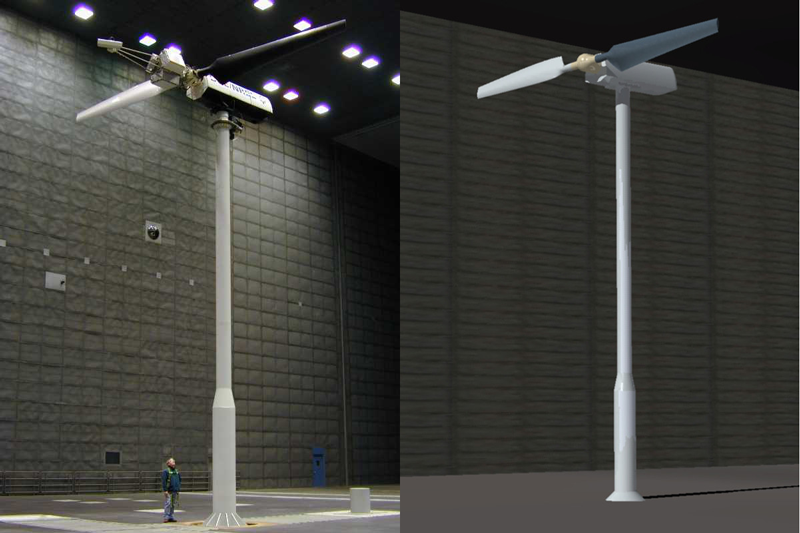 Figure 1: Original wind turbine in the NASA Ames wind tunnel (source: NREL), left. On the right, CAD model of geometry which is used within the simulation. 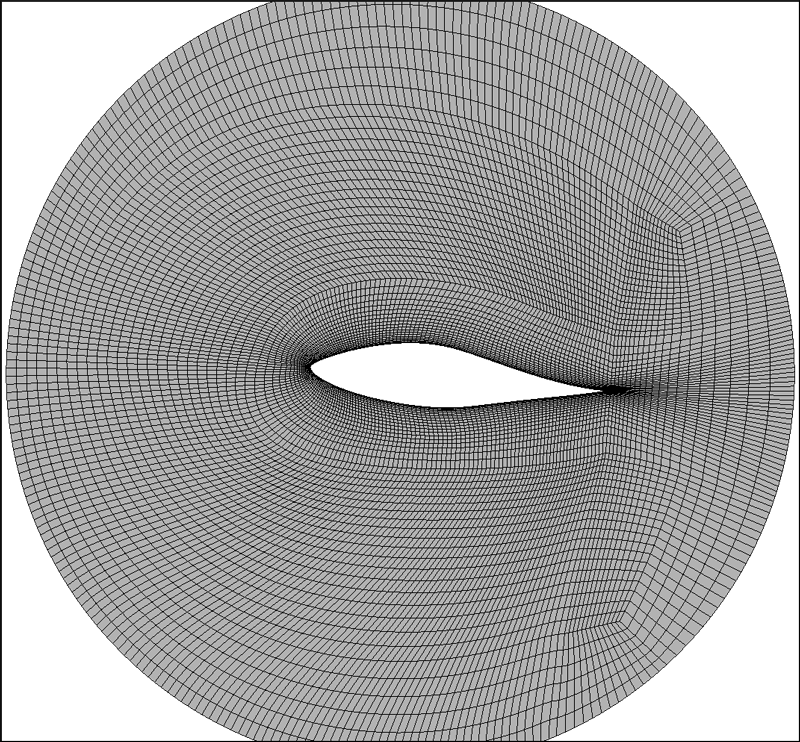 We used Pointwise to generate high quality block-structured meshes. High quality meshes are decisive for accurate pressure distributions on the blade surfaces (Figure 2). At the department of structural analysis we developed an open-source software framework for co-simulation which is called Enhanced MultiPhysics Interface Research Engine (EMPIRE). The software is available free from empire.sicklinger.com. OpenFOAM® is used for solving the incompressible Navier-Stokes equations. With EMPIRE, OpenFOAM and Matlab, it is possible to simulate an emergency brake maneuver of the turbine. 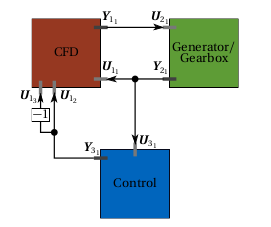 This involves a solution of the fully coupled system generator/gearbox – computational fluid dynamics (CFD) – control unit. Figure 3: Block diagram for emergency brake maneuver. The Interface Jacobian-based Co-Simulation Algorithm (IJCSA) [Sicklinger et. al] is used to achieve an accurate and stable solution. The entire co-simulation has around 85 million degrees of freedom. By using high quality Pointwise meshes in combination with EMPIRE, we were able to simulate the highly complex emergency braking maneuver of the wind turbine. The final result can be seen in Video 1. Sicklinger, S. and Belsky, V. and Engelmann, B. and Elmqvist, H. and Olsson, H. and Wüchner, R. and Bletzinger, K.-U. Interface-Jacobian based Co-Simulation: International Journal of Numerical Methods in Engineering. Issn. 1097-0207. http://dx.doi.org/10.1002/nme.4637. Doi 10.1002/nme.4637. Pages 418-444. 2014. Editor's Note: At the request of the authors, the References were updated in April 2014.